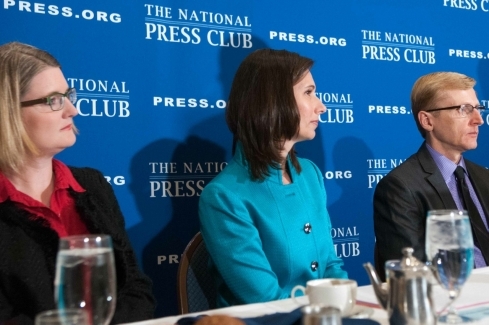 Deborah Hersman (center), the outgoing chairman of the National Transportation Safety Board, delivers her farewell at a National Press Club Speakers Breakfast, April 21, 2014. Joining Chairman Hersman at the head table were Angela Greiling Keane, Bloomberg News White House Correspondent, and Jerry Zremski of the Buffalo News. 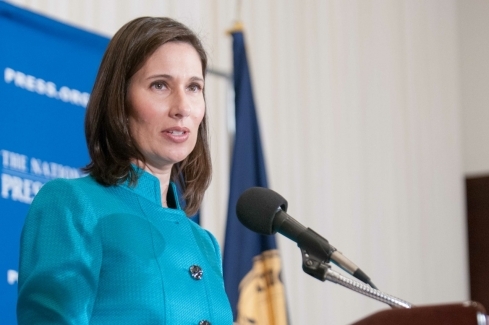 Chairman Hersman stated technology holds the key to reducing many of the accidents we have observed; that technology can succeed where humans fail in systems such as Ground Proximity Warning Systems in aircraft. 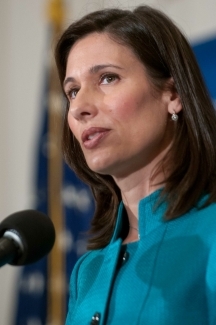 Hersman addressed issues involving surface transportation, in particular The Motor Carrier Safety Administration. Improving safety involves removing the worst of the worst; the weakest links. She said companies who skirt the rules gain an unfair advantage in the marketplace while endangering the public. 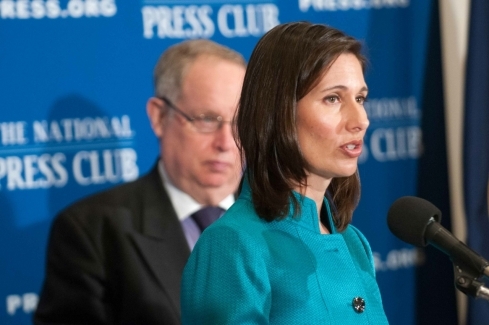 When asked about fuel shipments via railroad, Chairman Hersman stated that regulators are behind the curve. There has been a 440% increase in hazardous material shipments by rail without the congruent modernization of regulation. 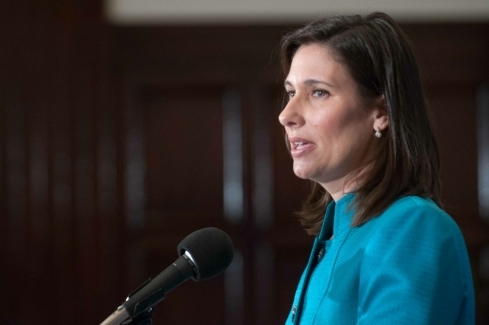 President Belkind asked if current rail cars are safe for the transportation of fuel to which Chairman Hersman responded DOT-111 tank cars are not sufficiently safe, and must be removed or retrofitted before carrying any hazardous materials.